I’m preparing to install my new 27 gallon fuel tank I purchased from the factory. I have the 2 portable 6 gallon tanks in there currently. JChaser was kind enough to send me some pics and advice on his install as he has the same boat and did the same fuel tank swap. I want to have all the parts I need in hand before I start and have a couple questions. Appreciate any more advice you guys could give me before I get started. You need a replaceable filter of some kind, that filters down to 10 microns (for a fuel injected engine). Inline filter not good enough for a fuel injected motor. They don't catch small enough particles, and they don't have any ability to filter water. Racor is the best, both due to how well they filter and the bowl that lets you see if you have crap in your fuel. Cheaper Moeller/Sierra canister styles work to, just change them religiously as they will rust if water-contaminated fuel sits in them. It's easy to get a slug of rusty, nasty water in your tank from a bad gas station or marina fuel pump. No need to flush the tank. You probably have two on-board filters, a high and low pressure. "Small" is the operative word. They may require a partial tear down of the engine to service. The idea behind the Moellers or Racors is they are easy to service and replace, have a lot more filtering capacity, and can be serviced on the water. The elements are cheap (though the complete Racor housing and fuel bowl is not). How do you prime the racor filter? I assume with the bulb on the fuel line? Are the racor filters easy to change on the water if needed? Prime with the fuel bulb... make take a while, but it works. With the Racor's, you can see contamination in the fuel bowl. Open the petcock at the bottom of the bowl and drain the filter to get it out, then re-prime and you are good to go (assuming the filter element itself isn't fully clogged with gunk). The oil-can styles are designed to be changed frequently (I used to do mine twice a year on the Arima, before I switched to Racor). I replace Racor elements once a year. Fisher; Listen to Threeweight! You need a 10 micron filter........either the Racor or canister will do. Those internal motor filters won't save you. I have the canister style and change it once a year. Mine does fine, but I have good "fuel habits". I'd mount the filter on the inside.......above the fuel tank and against that narrow starboard panel. Your going to need hoses. West Marine can advise you on that and has it by the foot. Make sure you double clamp the fill hose and "loop" the vent hose in such a way that it doesn't trap water. 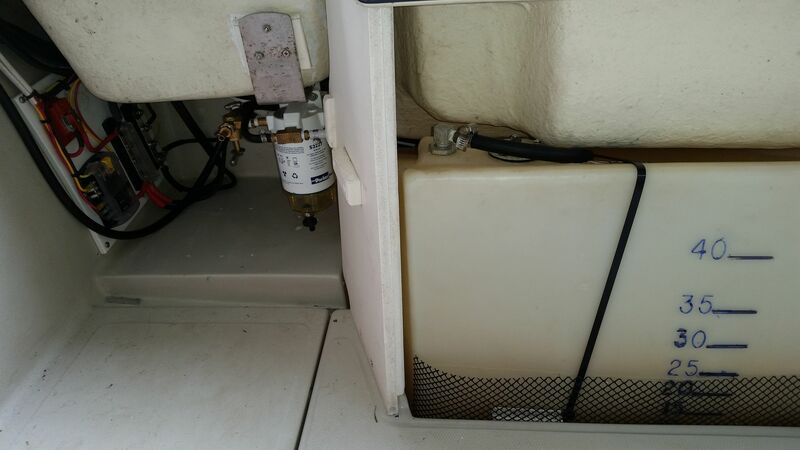 If your boat didn't come with a factory tank, then you'll (obviously) have to drill some holes. Before drilling, get the parts first. You don't want to go oversize on these. Also, remember, when drilling in fiberglass, start those bits in "reverse". Finally, if you have any questions regarding the accurate location of the fill and vent holes; a call to Arima would probably be your safest bet. If it is a trap-style vent that keeps water out, you can probably skip the loop. The idea behind the loop is to prevent water from getting into the vent hose and then into the tank. If you do use a loop, it should be an overhand loop, like this, so fuel can't pool in a low point. This looks like the vent I have. It is a trap vent style. Mine is a trap style. No loop in my hose. INstall it!! I had two instances last year that required draining and/ or replacing the filter while on the water. It would be dangerous trying to do the in motor filters. Placement options abound, just leave more room underneath to make it easier to drain the bowl for samples or purging. I have swapped out for a shorter filter model to help with that. Your boat will love you for it!!! That's one of the best and cheapest major upgrades you can make for your boat's reliability. Get the Stainless Steel head (yes, it's more money but the aluminum model corrodes in the damp darkness behind the starboard), and carry a spare filter and bowl along with an oil filter wrench that fits the filter size in your tool kit in case the filter gets overwhelmed by a large load of water from a bad fuel station. You just about need a vise and a pipe wrench to remove the bowl from the filter after it's been on there for a year. Ok, I fixed it. The pic is now straight! No more sore necks!